"What I try to do is be consistent," said President Barack Obama. He was talking about energy policy -- not about debating strategies, because as all the world knows by now, Obama projected a far more aggressive and engaged persona at his second debate against Mitt Romney than he did at the first. He managed to do it without being self-conscious, a neat trick since the reviews of his previous performance were so unanimously negative. He wasn't consistent -- lucky for him. At times the leader of the free world had to get down in the mud with his opponent; Romney is not the cleanest fighter in the world; he's a guy who not only changes his views and opinions as seems convenient but also, sometimes, alters the "facts" on which they were based. So it was that Obama's finest moment was also his most passionate -- when he declared it "offensive" that Romney had played politics with the assault on the American consulate in Benghazi last month and then accused the Obama administration of doing the same thing. Referring to the now-notorious press release issued by the Romney campaign while the crisis was still going on, Obama lectured, "You don't turn national security into a political issue." It had not, however, been a dull evening up to that point -- far from it. Obviously making amends for a passive performance at the previous confrontation with Romney, Obama struck back at his rival's charges and claims rather than just trying to ride them out and hang onto his dignity. Televised debates are not good places for maintaining dignity, as Obama learned the hard way that night, and in fact dignity may be counter-productive, especially when your opponent is given to rude interruptions and refusals to yield the floor. Heated conflict is considered great TV whether the subjects are momentous or frivolous, and there was plenty of heated conflict at the debate, but it was meaningful heated comment for the most part. As a result, George F. Will, ABC's king of commentators, said that after having seen every presidential debate held in his lifetime, "This was immeasurably the best." That's considerably more coherent, and convincing, than what anchor Scott Pelley said in his head-spinning post-mortem over on CBS: "Well, we have never seen the likes of that in presidential history," Pelley exulted. It would go down, he said, as "the night that presidential debates were changed forever." It will? No it won't. That's ridiculous. Presidential candidates have certainly clashed dramatically in past debates, including those done in the "town-hall format" that was used for last night's, with both men rising from stools to stalk each other around the carpeted floor. As in the first debate, Romney was reluctant to let the moderator run the show (and Republicans were already claiming last night's moderator, Candy Crowley of CNN, was biased against their candidate). When, late in the debate, Crowley asked Romney specifically to speak to the matter of "self-deportation," a phrase he coined for getting tough with illegal immigrants, Romney flatly told her "no," like a bratty kid. He didn't want to speak to it and he wouldn't, so there. He wanted to talk about something else. What he really wanted was to run the debate, not just participate in it. As in the first debate, his approach verged on bullying, as well as being just plain bossy. Or "bossy moo cow" as a friend, mother of two, used to say. Romney wanted to hammer away at the same points over and over, no matter what questions he was asked, which is standard behavior in American politics, whether at debates or press conferences. He wanted to say, for instance, that the middle class has had it bad under Obama, and say it and say it and say it, in terms as melodramatic as possible. He said middle-income families were "crushed" under Obama's policies, and used the word "crushed" again in reference to the same demographic and same policies a few minutes later. He also used terms akin to suffocating the middle class, murdering the middle class, hitting the middle class over the head with a club and throwing it into the river -- that sort of thing, and it isn't much of an exaggeration. Chastised for not fighting back during the first debate against Romney, Obama saved a reference to Romney's notorious crack about "47 per cent" of the U.S. population not paying taxes and just sitting around collecting government checks for his final summation, so that Romney had no chance to shoot it down. Romney obviously saw it coming, because in his closing remarks he made a pointed reference to caring about "100 per cent" of the American people, but Obama won the point with the help of the time clock and the format. 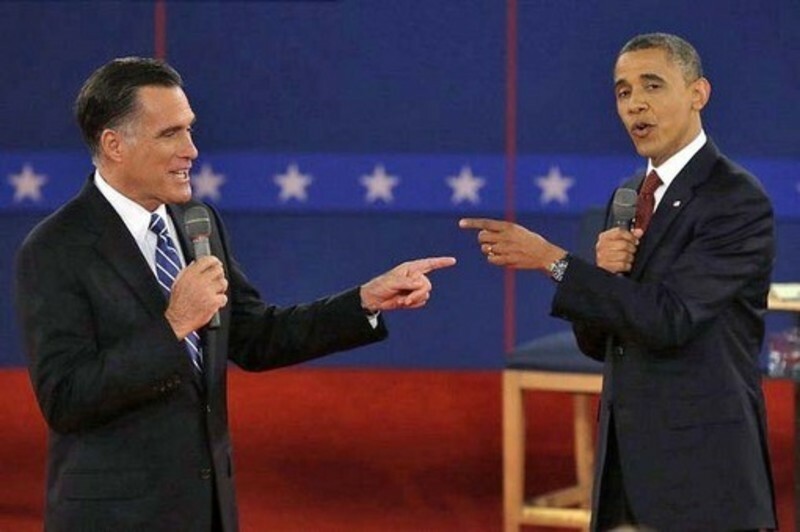 Many observers had wondered why Obama didn't attack Romney on such a vulnerable matter during their first close encounter, so he made up for it at the end of the second one. Having questions submitted by members of a pre-selected audience -- a few dozen supposedly undecided voters from the New York area (the debate was staged at Hofstra University) -- was only fitfully successful. One voter had tried to memorize an elaborately worded question and, stumbling over her words, had to pull out a paper and read from it. In wide shots of the assembled crowd, most of them looked enervated and bored; the Night of the Sitting Dead. One woman in the audience, however, came up with a pretty nifty question, asking Romney to list the ways in which he differed from the last Republican president, bumbling and goofy George W. Bush. Romney listed several ways and didn't go out of his way to sweeten his remarks with token praise for Bush, either. Romney also deserves credit for saying of the Republicans, "Our party has been focused on big business too long." No kidding! By saying that, though, Romney was able to segue effectively into his continuing diatribe about how beastly the Obama administration has supposedly been to small businesses and of course the crushed, stomped-upon, starved and tortured middle class. Can you, like me, remember a time when Americans generally chafed at being called "middle class," no matter how middle class they were? Seems it's ancient history now. The audience in the hall broke the moderator's rule against never applauding, never making a peep of any kind, during Obama's emotional comment on the Libya attacks and the deaths of beloved U.S. ambassador Christopher Stevens and other Americans. Obama conveyed deep personal concern as he discussed the murders and the attack, but Romney looked and sounded as though he still wanted to score political points off it. "Mitt Romney was not on his game," said the admittedly partisan Donna Brazile during the ABC post-debate analysis; she was biased, but she was right. By far, as at previous debates, ABC assembled the most illustrious group of commentators to talk about the event and went to the most trouble to fill out the two hours of air time allocated. Diane Sawyer and George Stephanopoulos ably co-anchored. A couple technical foul-ups were fortunately minor. Also part of the ABC group, columnist Matthew Dowd called the debate "a clear victory for President Obama," though over on NBC, Tom Brokaw was cautiously telling anchor Brian Williams that he thought neither candidate scored a decisive knock-out. And on CBS, Pelley just kept ranting on about what an unprecedented and history-making debate it had been, suggesting he hasn't paid very close attention to the last 50 or 60 years of American politics. In the hour before the debate, ABC aired another episode of "Dancing with the Stars," this one featuring a guest appearance by Donny Osmond singing a duet with British working-class discovery Emma Boyle. The song they sang seemed chosen to be appropriate -- something about "This is the Moment," the big night has arrived and that sort of thing. One line, "I won't look down," could almost have been a direct reference to Obama's bad habit of appearing on-camera with his head bowed as, apparently, he read over notes while Romney talked during Debate No. 1. He didn't look down, as it happened -- hardly at all -- during Debate No. 2. He held his head high, and not for nothing. Next Article: The final debate: Whoppers and bayonets Previous Article: Biden vs. Ryan: "More real"
Biden vs. Ryan: "More real"